A senior North Korean official arrived in Beijing on Sunday, apparently on his way home from Washington, after having discussed details of a second summit between North Korean leader Kim Jong-un and U.S. President Donald Trump. 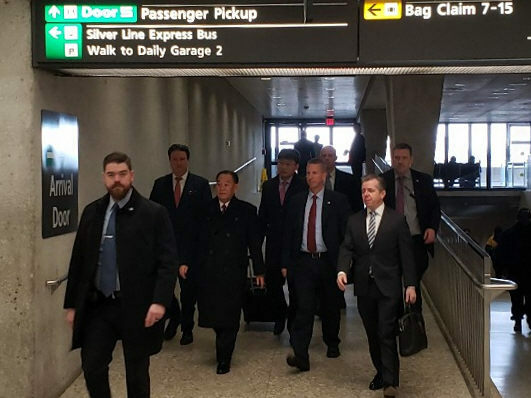 Kim Yong-chol, a close aide to leader Kim, arrived at the Beijing Capital International Airport at around 6:36 p.m. from Washington and left the airport, along with his entourage, using vehicles prepared by North Korea‘s embassy and the Chinese government. He is apparently en route to Pyongyang after a three-day trip to Washington where he delivered leader Kim’s personal letter to Trump. He also met with Secretary of State Mike Pompeo for high-level talks. After the meetings, Washington announced that the leaders of the U.S. and North Korea will hold their second summit late in February, though it did not disclose a specific date or venue for the meeting. Trump and Kim held their first summit in June in Singapore, at which they agreed to work toward complete denuclearization of the Korean Peninsula in exchange for security guarantees for Pyongyang. Progress, however, has been slow as Pyongyang wants reciprocal steps, such as sanctions relief, for steps it has taken since the June summit, but Washington demands more concrete denuclearization steps. Trump earlier said that the location for his meeting with Kim has been chosen and it will be disclosed at a later date. Vietnam is one of the most talked-about potential venues for the second summit.